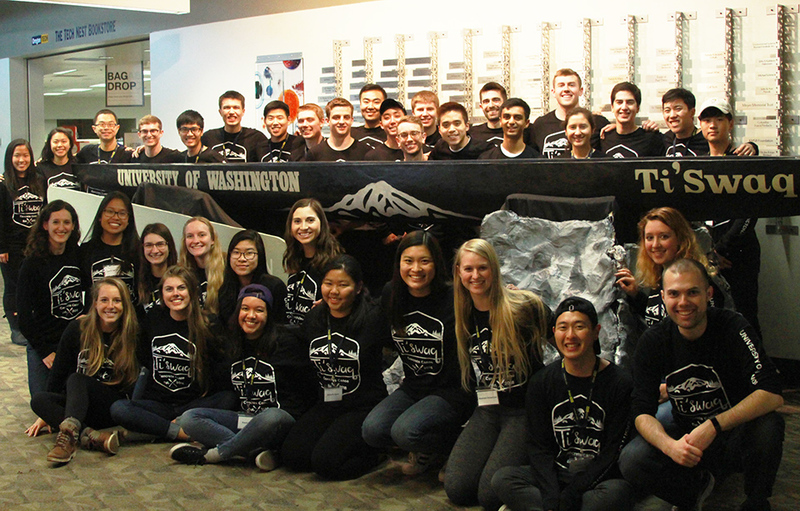 The team at regionals with the canoe, which features a snow-capped silhouette of Mount Rainer. The UW Concrete Canoe Team is hot this year. And it has nothing to do with their volcano theme. 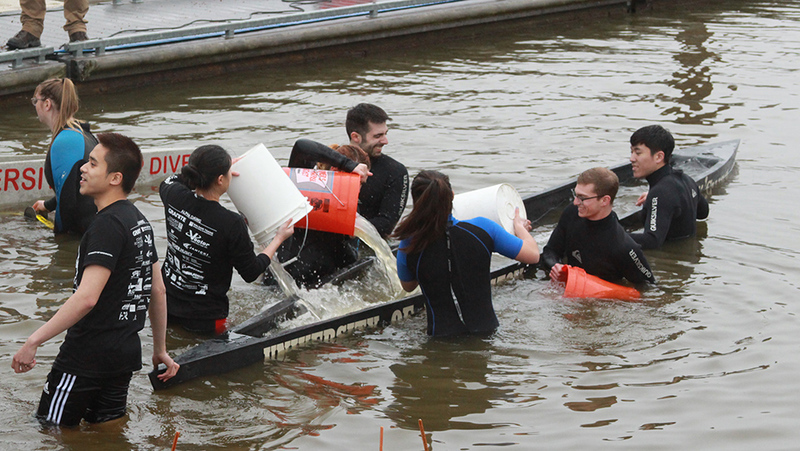 Competing against 13 other teams, the UW Concrete Canoe Team won the ASCE Pacific Northwest Student Conference Concrete Canoe Competition at the Oregon Institute of Technology on April 5-7. This is the sixth year in a row the team has advanced to nationals. 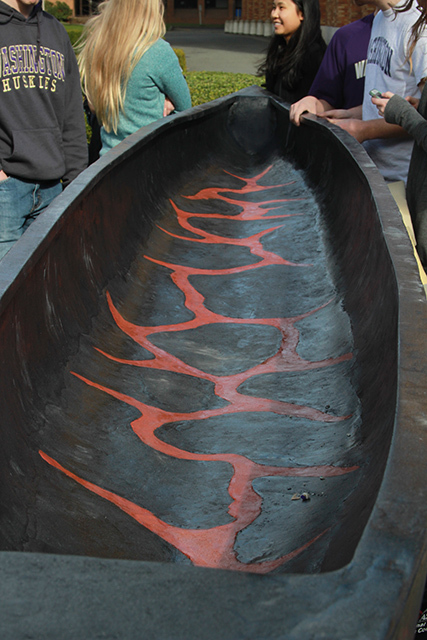 The canoe's interior magma floor made of red, orange and black concrete. While most competitions entail competing in four categories, there were only three categories this year, due to inclement weather that cancelled the races. Therefore, the scoring was based on the final product, design paper and oral presentation. The UW team placed first for final product, second for design paper and third for oral presentation. The 73-member team started working on the canoe during the first week of class in September 2017. A few enhancements this year include switching from Stalite to Pumice aggregate, designing a pigmented structural mix and post-tensioning the canoe in a female mold, rather than a male mold, to get a smoother outside. 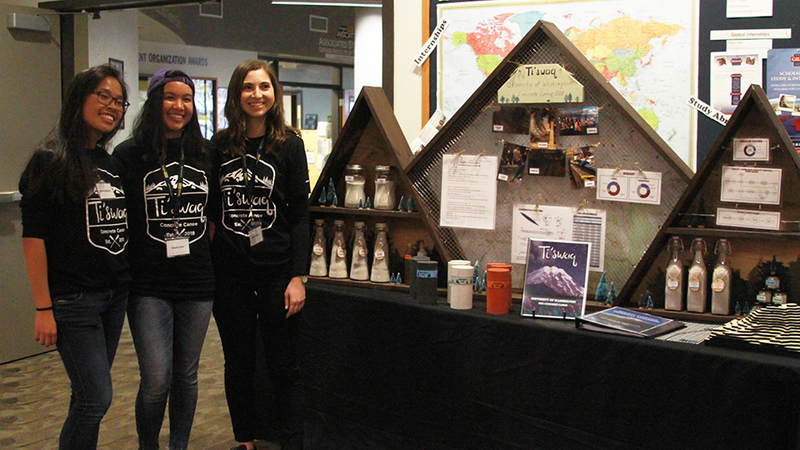 “Since we haven’t post-tensioned in a female mold before, that was a major design innovation that we did this year,” said team co-captain Michelle Horio. The team’s theme this year is Mount Rainier, an active volcano that is currently dormant. The exterior of the canoe features a snow-capped silhouette of Mount Rainer and the interior has a rocky magma floor. All design elements are created with colored concrete. The team will compete against 24 other teams at the National Concrete Canoe Competition at San Diego State University on June 23-25. The Concrete Canoe Team hopes to raise $13,000 by June 1 to send as many team members as possible to nationals. Check out their fundraising campaign. The team's product display, which features the materials in the canoe, construction photos and budget charts. Team members "swamp the canoe" by submerging the canoe under water and allowing it to float to the surface. Passing the float test allows teams to participate in paddling races.